Keywords: Adenocarcinoma, Appendix, Appendicitis, Mucocele, Colectomy. Diagnosis of malignancy in the vermiform appendix is quite rare. The most common histological malignant neoplasia found in this tiny portion of the gastrointestinal tract is represented by the mucinous adenocarcinoma. This entity predominates in males around 50 years of age, and clinical presentation usually mimics or occurs along with an acute appendicitis. Early diagnosis is outside the rule since most cases at this stage are symptomless. The authors present the case of a 59-year-old female patient who looked for medical attention complaining of abdominal pain. Physical examination and laboratory workup were poor in diagnostic findings. The computed tomography images were compatible with the diagnosis of appendicitis and/or appendiceal neoplasia. The patient underwent a laparotomy and right hemicolectomy. The histological examination disclosed a moderately differentiated mucinous adenocarcinoma of the appendix stage T4a, N0, M0. 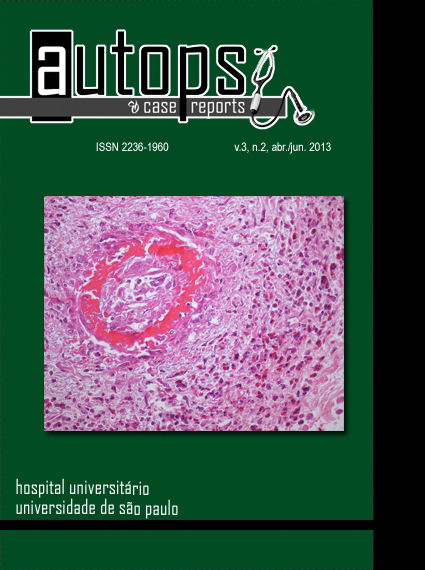 The patient outcome was uneventful and was referred to an oncological center.